Transcribed with permission from "The First 200 Years of Pendleton County"
Compiled and written by Millie Bowen Belew, thanks Millie! This small Methodist Church was located at the end of Ball Road, about 1/4 mile west of U. S. 27 at Boston Station. It was built shortly after Boston Station, near the Covington and Lexington Railroad, became a town in 1855. The building was officially dedicated in 1859. It enjoyed a prominent location and for many years Orvid E. Cowles sought to have a road established via the "Union Meeting House" that would have connected present day Highway 17 with U. S. 27. Mr. Cowles met much resistance to his proposal and never succeeded with his endeavor. The old church flourished in the 1870's along with the Boston Sawmill and the railroad. Serious flooding eventually caused the sawmill to be moved to Butler and this marked the beginning of the end for this once vibrant area. Its use declined rapidly after the turn of the century; however, the cemetery received burials as late as 1955 and 1961. In September of 1949 the Boston Settlers Association held a reunion on the church grounds. Among the descendants who attended were the Duckers, Bradfords, Mullins, Ellis', McClanhans, Lovelaces, Campbells, Burlews, Newkirks, Kirbys, Blasingames and Skinners. Effort to revive the church was made through the financing of a permanent committee to keep the church and cemetery. Initially, much was done to preserve the church but time has taken its toll on this noble effort and presently the church and cemetery are in serious need of attention. 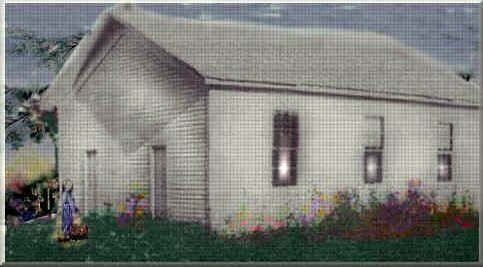 This small rural church was a part of the Methodist Conference from the early 1900's until the late 1920's. The building, which still stands, was meant to serve as an interdenominational church. It also served as a community building and a school. With Mr. O. P. Yelton as the chief carpenter, the men of the community donated work to erect the building. Nellie (Yelton) Mann, one of Mr. Yelton's daughters, took subscriptions to raise money to finance the project. The building was erected on land provided by Mr. Lloyd Kirby. One of the first Methodist ministers to serve the church was Rev. W. L. Clark, who performed the marriage of Mary (Mammie) Campbell and Gano Beckett on Christmas Eve, December 24, 1900. Other Methodist ministers continued to hold meetings once a month, with services on Saturday night, Sunday morning and Sunday nights. These services were well attended with the church filled to capacity and an overflow crowd outside. The Burlews who lived on the east side of the Licking River, across from Boston Station, came to church by crossing the river boat and walking about a half mile from the river to the church. They included the families of A. Douglas Burlew, Marion Burlew and Polk Burlew. Marion served as Sunday school superintendent for a number of years. Also crossing the river to attend church were Mr. and Mrs. Milton Mulloy. Other members were O. P. Yelton and daughters, Nellie and Cora, Mrs. Mollie Edwards and daughters, Aleene and Ada (Mrs. John M. Kirby), John Beckett and family, Mabel, Jewel, Ray and Bland, Jeff Bradford, Hannah and Flora Bradford, Aunt Lit Gosney, Anna and Lillian Sine, Mr. and Mrs. Henry Gosney, Mr. and Mrs. Frank Wright, the Parsons and the Arnold, Katie and Raymond were the last to leave. During the late 1920's the attendance began to decline, with a number of people moving their membership to Butler Methodist Church or other churches in the area. The Methodist Conference no longer provided a regular minister.